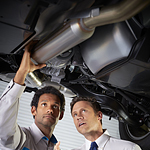 The back to school season is an important time to review vehicle care. For parents of school-age children or those sending them off to college, the condition of household vehicles is vital. The seasons ahead will bring cold, snow, and wet or slippery roads. You should begin by checking the dash or any warning lights such as tire pressure warnings and resolving those issues. Most drivers know the importance of following the owner’s manual recommendations for routine maintenance including oil changes, tire rotation, brake pads, and lights. For overall seasonal safety, every vehicle should have winter protections like jumper cables, flashlights, snow scrapers, and windshield washer fluid. Each vehicle should also have some blankets and bottled water. We want every driver to have an excellent school year. We can help by providing maintenance and overall checks on all areas of vehicle safety and upkeep. Please call or an appointment or drop by today.